Do you pack meals for yourself, your kiddos, or your spouse? I do. To do so, we rely heavily on stainless steel stackable tiffins, convenient thermoses to keep soups and stews warm, and these amazing stainless steel bento-styled boxes from LunchBots. Everyone knows that to-go lunches have the potential to be full of waste. When I was a kid, my brother and I must have gone through thousands of brown paper bags and plastic sandwich baggies between the two of us — just to ensure that our food could be carried to school. Pile styrofoam lunch trays, plates, or take out containers, plastic utensils, and to-go cups with lids and straws on top of all that, and you have a veritable mountain of trash. 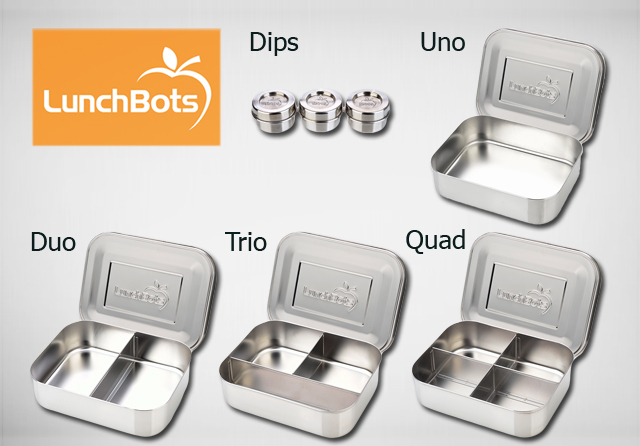 This week, I am excited to be giving away a set of stainless steel bento-styled boxes from LunchBots — valued at $95 — to one of you lucky readers! These are high-quality, extremely durable, stainless steel. If you’ve ever bought inexpensive stainless steel lunch containers, you know that feeling of utter disappointment you get when you realize just how cheaply they were made. The steel easily bends and kinks, the lids never fit quite right, and using them is an exercise in frustration. You will not have those problems with LunchBots. These babies are top of the line, with a fit and finish that makes you feel like they’re worth every penny you spent. And, they come with a face. Concerned about chemicals in plastic containers leaching into our food, I went on a search for alternatives. Stainless steel was the perfect material; it’s safe, lightweight, and non-breakable. However, I couldn’t find stainless steel food containers anywhere—not online, not in restaurant supply stores, not in kitchen gadget stores. 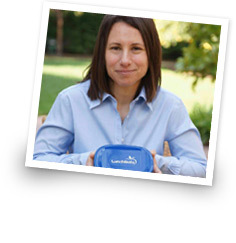 LunchBots is a family-owned business and our mission is simple: to provide the highest quality, best-looking, healthiest food containers on the planet. To enter the giveaway, you’ll need to subscribe to LunchBot’s Newsletter using the link below. Just click on the link, and it will take you to landing page on LunchBot’s site. Simply use your email address to subscribe. After you’ve signed up for the newsletter, you must come back here and comment letting me know you’ve done so. If you fail to leave a comment here, or fail to subscribe to their newsletter, then your entry will not be valid. 1. Follow LunchBots on Facebook. Click here to like their page, then return here and leave a comment telling me you’ve done so. 2. Follow LunchBots on Google Plus. Click here to follow their page, then return here and leave a comment telling me you’ve done so. 3. Follow LunchBots on Twitter. Click here to follow their page, then return here and leave a comment telling me you’ve done so. 4. Follow LunchBots on Pinterest. Click here to follow their page, then return here and leave a comment telling me you’ve done so. The giveaway is open only to U.S. and Canadian residents and will run through Sunday, August 11th. The winner will be announced soon thereafter. I subscribed…thanks for the great giveaway! I signed up for the Lunch Bots email. I signed up for newsletter! Love your site btw!! Thanks!! Subscribed to the Lunchbots newsletter. Thanks for offering a chance to win some of these products. Followed the instructions! What a cool give a way! Thanks for the opportunity to score sweet stuff!! I love these lunchbots!! Just signed up for the newsletter and liked on Facebook. Hi there!! I subscribed to lunchbot’s newsletter! Subscribed to the Lunchbots newsletter – thanks for the introduction to these great products! My dd and I both have many allergies and so everyday lunch is packed. Would love these products! Signed up for newsletter, don’t have Facebook, twitter etc. hope I win anyway my husband takes a lunch every day. I subscribed!!! The lunchbots look like fun! I would love to have this set. We are looking for healthier ways! And I subscribed to LunchBots! I like LunchBots on Facebook. Google plus now too. Will have to share on my blog if I win! 🙂 Site is about paleo eating and kids. I subscribed to their newsletter. Thanks for the chance to win! I liked the LunchBots FB page. I think the lunchbots set is a great idea! Thanks for the invite! I Follow LunchBots on Google Plus. Following LunchBots on Google Plus. I follow LunchBots on Twitter. I signed up! Now, I’m feelin luckyyyy! I have visited the Lunch Bot web site (the lunch boxes are beyond cool), liked them on Facebook and now follow them on Google+ and Pinterest. I think that’s it. Holding my breath – these would be the perfect gift for my grown son’s work lunches. I Follow LunchBots on Pinterest. I subscribed and would love to win. But thanks SO much for letting me know of this product. I need a set for my husband to carry his lunches. I subscribed to the LunchBots newsletter. I’ve signed up for the lunch bots newsletter, may I enter the drawing? I subscribed, and added to Facebook,Google+, and Twitter! Subscribed!! Thanks Kristen for all this giveaways :). Hopefully I’m the lucky one this time! Thanks for the giveaway! I signed up for the lunchbox newsletter. What a great product! Signed up for the newsletter. Thank you for the giveaway! Liked on Facebook. Looking forward to the great lunch ideas! Following on Pinterest. Lots of interesting boards! Thank you. I subscribed to the LunchBots newsletter! I have liked on their FB page. Love these lunch boxes. We run a B&B focussing on a chemical free environment for our guests and ourselves. We make our own soap, shampoo, laundry detergent and cleaning products and use locally grown organic foods. I like the idea of plastic and waste free packed lunches too. Signed up with Lunchbots. Hope to win. Liked on Facebook (& liked you on FB at the same time). 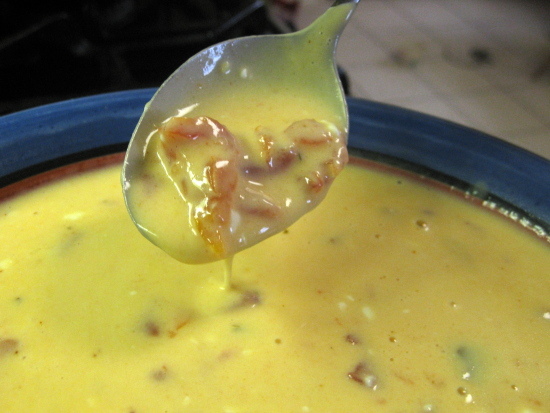 Have subscribed and entered what a wonderful way to service lunch or just snack. i subscribed to the newsletter, facebook, twitter, and pinterest. I likey on Facebook, Thank you. I just Liked their Facebook page. Subscribed to e-mail and liked on Facebook. I have registered and am excited for a chance to win such a great product. Eating healthy is very important to me! I signed up for the newsletter. These are great! I subscribed to their newsletter and liked them on Facebook. Subscribed to their newsletter and followed everywhere – these boxes look awesome!!! Love your newsletter and all the great information! I signed up for the Luncbots newsletter, these are great! I subscribed to the newsletter for LunchBots! These look great! I’ve signed up for the newsletter and hope to win. Thanks for sharing. joined the lunchbots mailing list! I also liked them on Facebook and Google +. I subscribed to their newsletter, liked them on facebook, and following on pinterest! Hope I win!!! 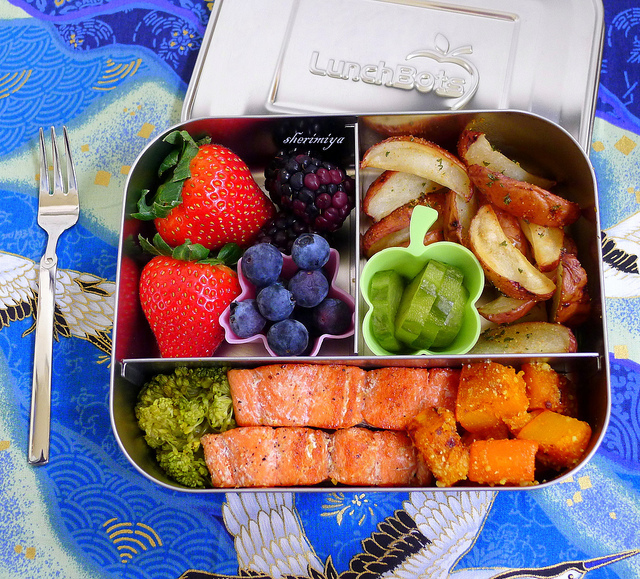 I could really us these nifty tins for lunch. I signed up for Lunchbots newsletter. Great product. It would be a treat to win! I wanna win, please! Newsletter, twitter, Facebook, Pinterest… All check! These are awesome! I subscribed for the stainless steel containers. Great idea, I always feel nervous about dropping my glass containers! I have registered to win. Really need to throw out all our plastic food containers. First I want to say that I love this website! I have signed up on the lunchbots website, liked it on facebook & following on pinterest. The stainless steel bento boxes are exactly what I have been looking for. These are fantastic. Would love a lunch box like this for my husband, could eliminate the plastic containers. The stainless steel container is genius. More durable, the dividers are wonderful and most importantly it is better for Mother Earth. Keeping my fingers crossed that we will win one. Either way though, good luck to all. I’m following Lunchbots on Pinterest, Google, Facebook and Twitter! After reading some of the other comments, reminded me that I also signed up for the lunch box newsletter. Thank you for sharing this new item with us. Have a great day. I followed on Pinterest AND liked AND subscribed! Signed up for the Lunchbots newsletter. What a great product! Signed up for the lunch box drawing!! Signed up and following on Facebook! Following on Google +, too. I signed up for your newsletters and would love to win the set of Lunchbots. I don’t like using plastic and this would be the perfect solution. Thank you. I also liked their page on Facebook and went to Pinterest to follow their page. I have subscribed to the LunchBots newsletter! Signed up for their newsletter and liked them on facebook! Very impressed with the product! Thank you for sharing. I have signed up for the LunchBot newsletter. Signed up for newsletter and liked on Facebook. Love their products! Followed on Facebook. What a great product! We are trying to stay plastic free as much as we can. Registered for the newsletter too! Just signed up for the lunchbbots newsletter and liked them on FB and am following on Pinterest and Twitter. This is an ingenious product bc we fear plastic chemicals getting into the food and as you know, aluminum is also bad! Signed up for the newsletter and liked on Facebook . Signed up and glad I did. Thanks! Love these! Thank you for featuring them and for the contest! And of course, I’ve signed up for the newsletter! Signed up for the newsletter and following on Pinterest. signed up for newsletter, can’t wait to receive it:)and following pinterest and facebook. fantastic idea for high school, busy college students and work. I signed up for the newsletter and following on Pinterest. These look great! I subscribed to the newsletter, liked on Facebook and following on Pinterest! I follow LunchBots on Facebook. I want this one. Thank you for putting this for giveaway.